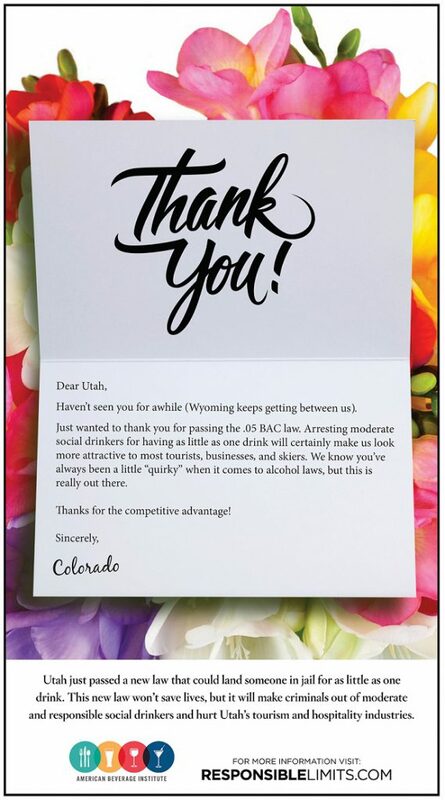 For those of you that like to have a couple drinks during dinner, you might want to think twice because you could end up in jail if you're in Utah. The .05 Blood Alcohol Concentration (BAC) law was introduced in the legislature by Rep. Norman Thurston and began to quickly move through the lawmaking process with little time for debate. Industry groups on the ground were caught off guard and put up little defense. However, the American Beverage Institute got involved and launched a funny and disruptive marketing campaign. Before we jump into the campaign, here’s a little more background on the .05 BAC law. What does a .05 BAC mean? A 120-pound woman would reach .05 after little more than a single drink. A 160-pound man would hit the .05 threshold after having two drinks. A .05 BAC arrest level will have a major impact on restaurants, on premise sellers, and associated industries. Restaurants, bars, and other hospitality establishments are already struggling to attract customers to opt for a night out over a night in. Unduly harsh penalties for moderate drinking will further induce potential customers to stay home instead of risking arrest for sharing a bottle of wine over dinner. ABI launched a petition opposing Utah’s .05 legislation—which garnered over 15,000 signatures. ABI traveled to the state multiple times to testify and discuss the issue with lawmakers. ABI produced a series of one-page explainer documents—sent to all Utah lawmakers—on issues surrounding the .05 law. ABI launched an effective attention-grabbing ad campaign, which made legislature readdress the issue with a number of measures. Well done, ABI!!! Keep up the fight!